Gorgeous 4X strategy game Sorcerer King is now available on Steam. Check it out here. 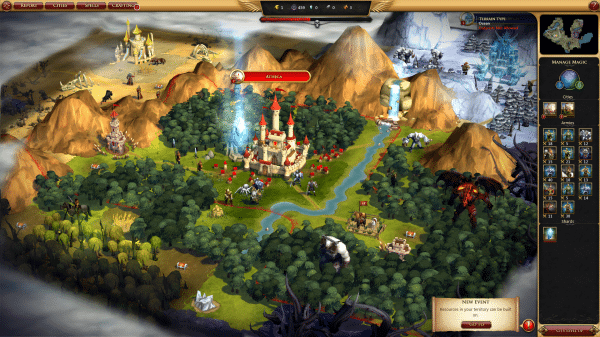 Sorcerer King is a 4X strategy game from the maker of Galactic Civilizations and Fallen Enchantress. Your people have lost a great war. Nice work. From the ruins, you must rebuild your nation’s strength, avoiding attention until you’re finally strong enough to confront the Sorcerer King. The game looks amazing, and it’s from a company that knows what they’re doing when it comes to Turn-Based Strategy. The Sorcerer King – This is not a fair fight. Your opponent is more powerful, and his onslaught against the Shards you must protect is unending. Stand up to fight, or appear to submit to his will until the time is right. Crafting – Rather than researching better weapons and armor, players must uncover the recipes and gather the components to build more powerful items through battle and adventure. Enchanting – Use the unique talents of your chosen sovereign to imbue equipment with magical properties that customize your forces’ capabilities far beyond anything you’ve seen in a fantasy strategy game to date. Unique Skills – Rather than a shared research path, each sovereign increases their power in unique ways. Building great armies, wielding the Forge of the Overlord, intervening in tactical battles, and even bending the earth to their will. Adventure – Hundreds of individual hand-written quests litter the landscape, bringing a little humor to the apocalypse thanks to the talents of Cracked writer Chris Bucholz. Rivals – Remnant factions cling to life in the Sorcerer King’s world, but they cannot hope to defy him alone. Ally with them to gain their unique champion unit and what help they can provide…or wipe them out to claim their land and loot for yourself. Endgame – Winning requires using all the game’s systems – crafting, enchanting, heroes, armies, magic spells, and more – to create a single army strong enough to storm the Sorcerer King’s fortress and prevail in the final battle.